A gas leak is usually recognized by smell, sight, or sound. SMELL - Natural gas is colorless and odorless. We add a distinctive, pungent odor so that you'll recognize it quickly (not all gas transmission pipelines are odorized). SIGHT - You may see a white cloud, mist, fog, bubbles in standing water, blowing dust, or vegetation that appears to be dead or dying for no apparent reason. SOUND - You may hear an unusual noise like roaring, hissing, or whistling. MOVE to a safe environment. DO NOT strike a match, use telephones, switch on/off appliances, lights, or even a flashlight in the area where you smell gas. These items can produce sparks that might ignite the gas and cause an explosion. Provide the exact location, including cross streets. From a safe location, contact your local natural gas utility. 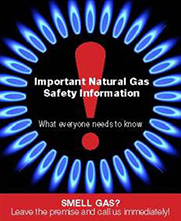 Click here for a link to the Public Awareness info of natural gas providers in the region. Copyright Northeast Gas Association © 2018. All Rights Reserved.